Without question, the emergence of Web 2.0 has revolutionized many aspects of people’s lives. One of its most basic characteristics is how communication is now enabled globally, allowing information to flow easily from one part of the world to the other. This underlines a new mentality, changing the way people govern their lives and form communities. The relatively easy access to the internet in the western world, means that, content is easily produced and shared, making the web a large digital community with active users participating, exchanging information and taking part in discussions (Pieri and Diamantini 1217). Naturally, these new technologies have played a major role in reshaping the education landscape as well. Therefore, the need to be digitally literate is of great importance, as it can affect not only the way people learn, but also the way they evaluate online content. It is critical that digital literacy is incorporated in education systems globally, since this will facilitate the younger generation to better understand the “[…] influx of new technologies, the use of computers as a daily business need, and the wealth of information worldwide” (Daud and Zakaria 460). For the successful integration of digital literacy in the education systems, the educators themselves have to be familiar with the concept of digital literacy, and make a collective effort to assist students in using new technologies and new media. As Buckingham rightfully points out, “[w]e need to equip students to understand and to critique these media: We cannot regard them simply as neutral means of delivering information, and we should not use them in a merely functional or instrumental way” (Buckingham 263). It is thus critical to examine how educational policies are implemented. As Lovink suggests, there is a need to explore how current educational policies are unable to cover emerging issues arising from the ways online information is manipulated and used as part of what he calls “the commodity logic” (4). Lovink concludes that “the underlying problem” is “namely the poor quality of our education and the diminishing ability to think in a critical way” (4) and he warns that this “inability” of the educational system might have unpredicted negative effects in future generations, as it could deprive of the ability to critically evaluate and question online content (4). The aim of this project is to explore how education policies are implemented, using Greece as a case study, so as to offer our perspective on Greece’s policies on digital literacy, since that current literature does not adequately cover the localities of such debates and the impact “poor quality of education” (Lovink 4) can have on a local level. Essentially, we will attempt to map the current educational policies concerning digital literacy in Greece and critically evaluate the situation in relation to the current academic debate, as presented in the aforementioned literature. Due to the fact that Greece is a member of the European Union, this can offer a glance at the wider EU strategy for digital education. Additionally it would be interesting to see if the recent economic crisis in Greece has affected these policies in any meaningful way. At the same time the fact that one of the researchers is a qualified teacher in Greece also offers additional familiarity that may help during the evaluation of the Greek educational policies. Due to the brief nature of this project and the time-space limitations that accompany such endeavors, we focus on the critical evaluation of the educational policies in Greece relating to digital literacy. This will allow us to observe if and how the educational policies adhere to the main points of critique found in the relevant literature. The form of analysis is similar to a qualitative case study, as described by Yin in his book “The case study anthology”, with an “unstructured” data collection and analysis method. More specifically, we attempt to recognize and then visualize the main recurring themes of the literature in relation to the main points of the Greek educational policy. In order to present our findings in an interesting and engaging way, we used several visualization techniques. As Gray (229) describes, data visualization methods are an emerging field with various implications in both qualitative and quantitative research that can be used as a means of presenting data in interesting ways, while at the same time having “multiple and diverse forms of usage”. Therefore, these techniques are applied in order to present our findings in a more visually appealing way. Additionally, the results will be published in the form of an online website containing the aforementioned visualizations. From a list of 10 texts delving into various levels of educational policies (from American policies to European), three texts illustrating the Greek educational policies were selected based on the following relevance categories. Generally, the observation and categorization of key terms within the wording of the policy files was easier than that of the academic texts; the reason being that the two selected texts had a large number of simply worded categories, as opposed to the complex, in-depth academic language used in the academic literature. Geographic relevance to our subject. Based on the localization of our research papers on the case of Greece, papers focusing on the Greek situation were selected as opposed to papers based on American and international evaluations. Contextual relevance; texts that specifically talk about digital education/literacy as opposed to more general texts about education. Image 1. All of the relevant terms found in the educational policies literature. The above word cloud in the shape of a map of Greece creates an amalgamation of all the terms found in the three relevant texts. While the colors of the words do not represent any specific categorization, the size of the words indicates the frequency with which these words are found in the educational policies literature. From an initial observation we can see that terms like “implementation”, “learning”, “teaching”, “critical” and “improvement” are just as prevalent as the central term of “information technologies”. This could indicate an attempt to improve the current methods of teaching and learning in regards to subjects appearing with smaller font sizes. For example, words with the “e-” prefix: E-safety, e-society, e skills, e-entrepreneurship etc. It could also be an attempt to focus on more general issues, such as infrastructure, online research and multimedia. When it comes to the academic literature, certain problems were in need of assessment. For example, the academic structure itself rarely presents a large variety of terms and issues. On the contrary, it focuses on in-depth analysis of specific themes and issues. Therefore, we could not find enough relevant results in three texts, which is why nine texts were selected in an attempt to find as many connections to the policies as possible. While our initial literature consisted of both empirical/case study based research, we decided to focus on the more abstract and theoretical texts. The more theoretical texts, being more broad in their argumentation they can be more easily compared to our case as opposed to specific case studies that have less commonalities with the Greek digital literacy policies. 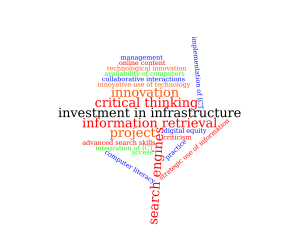 Themes identified in the form of suggestions for researchers, at academic institutions. Generalized suggestions on the educational system as a whole. Summarized below are the main terms derived from the following texts. References to these texts can be found at the end of this article. Image 2. 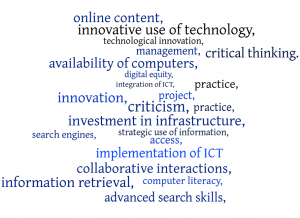 Illustration of the most relevant terms appearing in the academic literature concerning digital literature. Presented in the illustration above several of the terms and themes are also present in the educational policies texts. Some examples include suggestions about “search engines” and how they influence our online searches. Consequently, they also propose – albeit in far greater detail – ways to improve our search and information retrieval (critical) skills. Surprisingly enough, we can even observe themes that have to do with the need for access and availability of technology, similarly to one of the main points of the policy makers. As explained, there are less comparative terms to be found here, despite the academic literature used being far larger in mass than the educational policies. This is due to the very structure of the academic articles that does not present a large number of terms but rather delves in depth into specific issues surrounding digital literacy. Nonetheless, enough themes have been identified to make the following comparison possible. Red: Similarities in the approach of online research and search platforms and suggestions for the development of critical thinking. Green: Similar approaches that have to do with access to technology. Black: Similarities in policies for infrastructure and hardware. Blue/Light Blue: Loosely related terms/ broadly used terms. As the visualizations show, both the academic literature and the educational policies have the terms in red (online research and critical thinking) as their most prominent ones, followed by the orange ones (innovation and entrepreneurship). Meanwhile, the academic literature’s biggest terms have a focus on information retrieval and critical thinking (red). On the other hand, the policies focus more on access to technology (green) than the academic literature, and they also have a lot more loosely related terms (blue) than the academic literature which is to be expected, based on the types of texts we have analyzed. Most importantly, the lack of sources from Greek governmental institutions was a limitation. As suggested in the analysis, the irregularities and differences of the two types of texts, namely the differences between the structure and the language of academic literature, as opposed to governmental and institutional press releases, were a large obstacle in the fulfillment of this project. In depth analysis was out of bounds for the scope of the present project, therefore a certain “quantification” of some otherwise “qualitative” data was necessary for the completion of this project. This is also apparent in the way the above categories were created as a certain level of abstraction was necessary for the comparisons and illustrations to work. Indeed the results have shown that certain parallels can be drawn as commonalities between the educational policies in Greece and the more general critique found in academic literature. However, as brief as this project was, it reaffirmed the suspicion that there seem to be more differences than commonalities in the way the need for “digital literacy” is viewed by the policy makers as opposed to the academics. For example, policy makers still value and focus on the creation of solutions to problems in accessing the technologies as well as problems with the technological infrastructure of Greece and the EU. On the other side, the academics have moved to much more complicated matters, such as, discussions around the power that online paragons like Google and Facebook have over the manipulation and control of online information and data. These discussions often delve into the abilities of both educators and educated to distinguish and understand the powers these computational corporations have over most of the contemporary online knowledge. Either way, the observation that academics have moved far beyond the scope of current educational policies, is not necessarily bad, as those insights can prove very useful in the development of future policies. Yet, a worrying aspect of the seeming “inability” of policymakers to catch up with current technological and academic progress is that there might never be enough time to “catch up” as the corporate giants start leading the way in digital education. If you would like a more in depth view to some additional insights and visualization of additional findings, please visit the website we created especially for the needs of this project here. Γρηγοριάδου, Μ. “Επιμόρφωση εκπαιδευτικών στη χρήση και αξιοποίηση των ΤΠΕ στην Εκπαιδευτική Διδακτική Διαδικασία, του ΠΑΚΕ Αττικής και Στερεάς Ελλάδας.” (2011). Buckingham, David. “What Do Young People Need to Know About Digital Media?.” Digital literacies: Concepts, policies and practices (2008): 73-88. Buckingham, D. (2010). 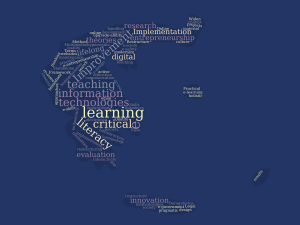 Defining digital literacy. Medienbildung in neuen Kulturräumen, 59-71. Buckingham, David. “What Do Young People Need to Know About Digital Media?.”Digital literacies: Concepts, policies and practices (2008): 73-88. Gray, Jonathan, Liliana Bounegru, Stefania Milan, and Paolo Ciuccarelli. Ways of Seeing Data: Toward a Critical Literacy for Data Visualizations as Research Objects and Research Devices. In Innovative Methods in Media and Communication Research, edited by Sebastian Kubitschko and Anne Kaun, 227–51. Springer International Publishing, 2016. doi:10.1007/978-3-319-40700-5_12. Jimoyiannis, Athanassios, and Gravani, Maria. Exploring Adult Digital Literacy Using Learners’ and Educators’ Perceptions and Experiences: The Case of the Second Chance Schools in Greece. Educational Technology & Society 14.1 (2011): 217–227. Lovink, G. 2008. “The Society of the Query and the Googlization of Our Lives: A Tribute to Joseph Weizenbaum.” Eurozine. http://www.eurozine.com/articles/2008-09-05-lovink-en.html. Marres, N., 2012. The redistribution of methods: on intervention in digital social research, broadly conceived. The Sociological Review, 60(2012), pp.139–165. Venturini, Tommaso, Mathieu Jacomy, and Debora Pereira. 2015. Visual Network Analysis. Working Paper, Sciences Po medialab. http://www.medialab.sciences-po.fr/publications/ visual-network-analysis. Yin, Robert K. The case study anthology. Sage, 2004.